This spring, the Yellow-billed Cuckoo is making the journey from its overwintering grounds in South America through the forests of Central America and then up to North America. It is a perilous journey because of the destruction of forest habitat along the way. Scientists have partially attributed declines in this species to deaths that occur during migration. The western sub-species is now considered in danger of extinction and is under review for listing under the Endangered Species Act. Through Paso Pacifico’s migratory bird conservation initiative, we are working to improve the chance of a successful migration for many neotropical birds. This program has been supported by the US Forest Service International Institute for Tropical Forestry and other partners since 2009. Through the program’s semi-annual bird monitoring we have documented the Yellow-billed Cuckoo during its migration. 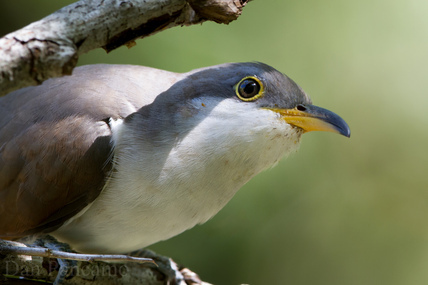 We are now building partnerships that will increase protection and monitoring for the Yellow-billed Cuckoo at key dry tropical forest sites throughout Nicaragua. These private sector and non-profit partners include Morgan’s Rock Hacienda & Ecolodge, the Richland Center-Santa Teresa Sister City Project, and the Reserva Privada Quelantero. We are also expanding our international partnerships with groups such as the Southern Sierra Research Station and the Insitute for Bird Populations. These two organizations have unique expertise in threatened migratory birds and in building local capacity to protect and study them. Learn more about our migratory bird conservation here.